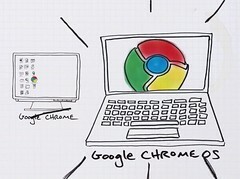 Although you may get confused by ChromeOS being some type of flavor of Android, it is anything but this, with the two OSes only sharing a common *Nix background, ChromeOS thus far has just been a pipe dream of Google’s, asides from it being placed on a few Chromebooks, ChromeOS hasn’t seen much buzz, but that might change with the most recent update of the OS, sporting features like an improved desktop, taskbar, and a Updated UI, for more check out ChromeOS. One of the newer features of the new Mac OS Lion is the virtual desktop feature which allows you to have multiply desktops for various different uses, but it wasn’t all that easy to customize, but with a new Lion Update some of that has changed, for more check out this article that talks more about the changes to the virtual desktop, HERE. If your looking for a Operating system that is truly optimized for netbooks then you might want to give the Operating system Lubuntu a try which is just that, for more check out this article HERE. If your excited about the recent Developers build release of Windows 8 then you might be dying to be one of those lucky folks that has a Windows 8 Tablet, but if you weren’t perhaps you can make your own, check out this article that talks about how you could go about doing this HERE. If you have seen recent articles talking about various parts of Windows 8 then you’ll be pleased to know that yet another new part of Windows 8 is the intergration of Windows Live and Sky Drive services which will attempt to link those accounts to your Windows machine, making these services extend your desktop to a degree, for more on how this works in Windows 8 check out this article HERE. Your trying to run a virtual copy of Windows XP without having to learn about virtualization technologies well then you might need to check out this great program that can run the operating system within your browser, the application is called JPC-2. So all you do is internet based, and your ready to make the leap and move to an OS that is totally about the internet, well check out Splashtop a OS based on Chromium, It will work on most windows machines, for more information check out their homepage HERE.